The saga over Twitter’s new hardline stance against developers just got more interesting. While Twitter officials downplay the company’s crusade against new third-party Twitter clients, with claims 90 percent of active Twitter members use official Twitter apps on a monthly basis, fresh analysis suggests third-party Twitter apps account for much more traffic: 42 percent, according Sysomos, a social media analytics company. 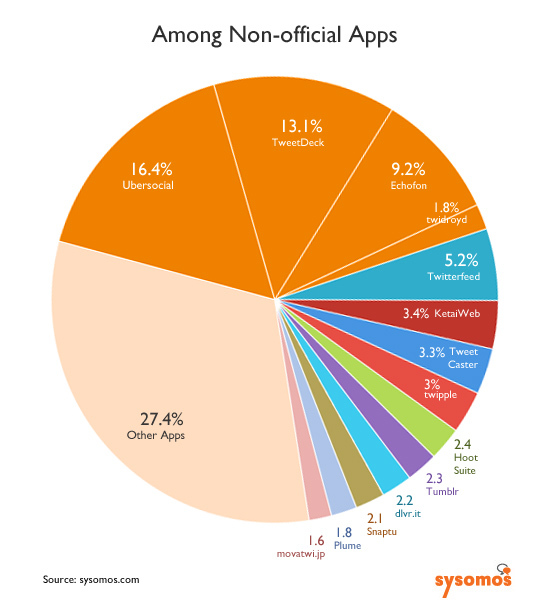 The data illustrates why the company may be so anxious to clamp down on third-party apps: They command a very sizable portion of apps that can’t be monetized in the same way native apps can. And they explain why Twitter upped its battle with third-party clients last week when the company’s platform director, Ryan Sarver, bluntly told developers to not pursue new Twitter clients and told existing client makers they would be put on a short leash. The latest numbers from Sysomos show that changes to the Twitter terms of service and the company’s enforcement of the rules is having a much bigger impact than Sarver first suggested. Sysomos arrived at its numbers by analyzing 25 million tweets on March 11. 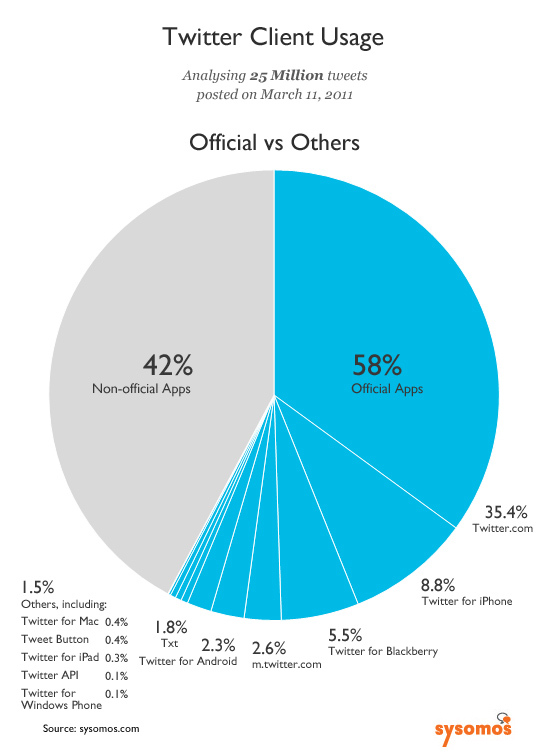 It found 58 percent of tweets were made from official Twitter clients. Twitter.com led the way with 35.4 percent, followed by a gaggle of mobile apps for iPhone (s aapl), BlackBerry (s rimm) and Android (s goog). Meanwhile, unofficial third-party clients made up 42 percent of tweets, led by Ubersocial, TweetDeck and Echofon, all apps owned by UberMedia. UberMedia, if you recall, recently had a handful of its apps suspended for policy violations stemming from privacy, monetization and trademark issues. From the numbers, you can see that Twitter’s biggest challenge comes from UberMedia, which my colleague Mathew predicted would result in a showdown as Twitter takes more control of its platform. But the reality is, third-party clients are slowly waning in popularity. Sysomos found that in June 2009, unofficial Twitter apps made up 55 percent of all tweets, suggesting Twitter is getting more traffic over time. It has helped its cause by buying up clients like Tweetie. Sysomos suggests the discrepancy between its numbers and Twitter’s comes from the fact that Twitter was apparently counting users who use Twitter apps on a monthly basis while Sysamos was counting the people who actually tweeted on March 11. It appears Twitter may be counting users who are not as active as users of other third-party apps. As we’ve pointed out, it makes sense for Twitter to take more control of its platform to make money, but it comes with some cost to good will with the developers who helped make Twitter a success. With the latest numbers, we can see that Twitter recognizes there’s a big opportunity in being the main presenter of tweets. But right now, it has to contend with developer partners who are handling a very sizable chunk of traffic. That might explain Twitter’s latest stance. If it really had 90 percent of all tweet traffic, it wouldn’t need to lay down the law. The market would have spoken already. In my opinion it is impossible to stop devs from developing… The future of twitter will go one of two ways, either devs will make 3rd party apps for twitter, or they’ll make a new twitter that’s more dev friendly. If Twitter tried to block 3rd party apps, we know what direction it will go. OStatus, and “open status standard”, is out there. status.net is built atop it. One welcome UX difference is that @replies are inline with the original status. There’s also Dave Winer’s system that would be more distributed in that it would allow third parties to form their own “safe places” while the main service was down. The next Twitter would need to take money from users up front, perhaps charging much more for brands and high profile users, whose presence would draw more regular users and thus more need for hardware and networking. Those two claims aren’t exclusive, especially if Twitter considers their web client an official app. Every time I click a “tweet this” button I’m taken to the twitter page to post the tweet. Good article. FWIW (and I’m a fairly active Twitter user) the website used to be fine for me. Then they moved to “new Twitter” which makes really heavy use of Ajax – and is basically unusable on a slightly flakey mobile or other connection. At that point I downloaded Twitterific, which is much lighter on network use and hence more reliable. Haven’t looked back. Twitter really have only themselves to blame. Thanks for sharing this with the Gigaom readers Ryan! As Liviu points out – what Twitter needs to do is to improve its in-house Twitter apps. People like me, use UberMedia, Tweetdeck and Hootsuite et al, simply because they manage the tweeting process much, much better than Twitter’s own apps. Twitter’s mobile app is a very poor relation the feature rich offering of its competitors. The web app is very weak compared to Hootsuite or Tweetdeck. I use Tweetdeck on my iMac (and on my old Windows box), UberMedia on my Blackberry and Hootsuite on my iPhone 4. The answer for Twitter is startlingly simple – build a much better in-house Twitter app! Or buy UberMedia and Tweetdeck! And/or start insisting that app developers enter into a revenue sharing arrangement. What frustrates me is that you had Sarver himself and others at Chirp last April applauding how so many developers were extending their platformâ€¦ making Twitter a platform. From what I read and seen online, there wasn’t the slightest hint this kind of change was happening. Perhaps the Tweetie purchase and New Twitter were bigger hints at this change than they appeared at first. The extended API that came with New Twitter gave me ideas about a noise-free client that would ignore retweets and conversations, but I guess that’s for the recycle bin for now. I think that Twitter is cutting down on these “clients” to increase their returning users. Less Twitter Clients = more direct and returning traffic = more impressions = increase in potential revenue. 2. Push promoted tweets through the API. Assume the app developers will find another message bus. Hmmm… who might be licking their chops right now? IMHO, this really boils down to a question of control and ultimately censorship. I care about the new medium of communication that Twitter pioneered, not necessarily Twitter. Twitter will become more and more a single point of censorship easily blocked by belligerent authorities. My two cents on the matter here, http://siculars.posterous.com/twitter-monoculture . UberMedia should build a “twitter backend” and start migrating users over to it :). What’s sad about this is that once Twitter works *only* through the twitter page and clients, access to Twitter will be easily cut off by countries where people are making revolutions. If you remember the Iran revolution, it was very hard to stop people from tweeting because they had these clients and could access it from many different places, not from the Twitter site, which was blocked long before. Twitter may give whatever reason they want but at the end of the day, this is all about making all Twitter users to see their own ads. Claiming that the digerati or professionals skew the numbers is, in fact, skewed. In meeting with users throughout my region I have found that the vast majority are not only using Twitter simply for thier own personal (entertainment/goals/communications), but they are also using third party applications. These are not folks who work with tech or get paid to manage social media, they’re the Joe Fridays hanging around with friends in a digital space when thier lives keep them physically separated. With the widely varied reasons that different people use Twitter and the differences in the way they interact through it, looking at the source applications and breaking those numbers down appears to be the only reliable means of measurement. However, I think those numbers should be attained over a greater spam of time, especially since March 11, 2011 was a tweet heavy day following the disaster in Japan, causing folks who would not have otherwise tweeted that day to join the conversation. This comment was posted from inside Tweetdeck’s iPhone app, from a non-professional tech-tard. This comment was posted from inside Tweetdeck’s iPhone app. Twitter’s “90% are using” includes Twitter.com, which had 28 million uniques in Jan 2011 according to compete.com. Not all the unique visitors have or set up accounts, but the 90% of actives is still going to contain an enormous long tail of once a monthers. The heaviest use of Twitter has always tended to come from 5-10% of accounts. So it’s totally expected that 90% of users don’t account for anything like 90% of traffic. Ryan, thanks for writing this up. The official position of the new rules being about user experience confusion, etc, is such an obvious load of crap the Twitter team should be embarrassed for using it. Clearly this is about monetization. Period. The problem with these numbers is that they skew, again, to the digerati. People who work in the space love numbers about themselves – but frankly, the noisiest are going to be, many times, professionals. Non-professionals for the most part seem to use the web and official apps, at least going back in a cursory manner through our data and our clients. But of course, those of us with professional, branded accounts are going to use these other tools, as well as power users, and tweet more often. I’ll be honest, I have met only a handful of non-professionals who use anything other than the web or official apps. You can almost guarantee if you see “Tweetdeck” or “Hootsuite” (or even UberTwitter/Ubersocial many times) that it’s someone who does this for a living or is in marketing. There may be a better rationale for the discrepancy – Twitter is measuring the percentage of users that have actively used official apps, whereas Sysomos is tracking the source of all tweets. The variation comes from the members that fall into both – those that use more than one app (e.g. using an official app on their iPad, but TweetDeck on their desktop computer). These people would count as users of official apps, even though they may submit most of their Tweets through a 3rd party app. Did Sysomos break down the 25 million tweets by user or just by application? If they only broke it down by application, then it’s possible, however unlikely, that those people who Tweet through “non-official” applications just happen to tweet more than official client users. It would have to be a significant amount more to make a difference. But if that’s the case, it could also mean that “power tweeters” just prefer non-official apps. I think you’re right. Power tweeters are likely drawn to third-party apps because they often have different features not found in official Twitter apps like better notifications or analytics. But why doesn’t Twitter provide a common platform to help third-party apps monetize their work? I mean, wouldn’t those 3rd party apps desire some money also using whatever monetization model Twitter could provide? Wouldn’t Twitter be satisfied with a 32/68 model like in AdSense? this way, everyone could be happy and Twitter continue to grow. Yes, but at the same time, tracking by number of tweets still show who’s using it the most. Using Twitter’s number, I’m an “official” Twitter user because I have the Twitter for iPad app. I send MAYBE 10 tweets a month on the iPad. In contrast, I’m using third-party apps on my laptop. where I use Twitter the most. Counting by traffic, I’m a third-party user. Counting by Twitter’s numbers, since I occasionally use their official app, I’m part of the 90%. If you are looking at advertising numbers, it’s going to be the usage, not the number of installed apps, that’s the metric.